Signing of MoU between Saranathan College of Engineering and Irrigation Management Training Institute/PWD/WRD, was held on 25/09/18. Dr. G. Dhanalakshmi, Professor and Head, Department of Civil Engineerig, welcomed the gathering. Dr. D. Valavan, Principal, delivered the Presidential Address. In his Address, he mentioned about the MoU, Clauses of MoU such as Research, Guidance for Projects, Attending Seminars, Workshops, Guest Lecture, Training Programmes, In-Plant Training, Internship, Symposium, and other technical programmes. Er. M.K. Sugumaran, Chief Engineer, PWD/WRD, Irrigation Management Training Institute, Thuvakudy, Trichy was the Chief Guest and Signing Authority for this MoU. In his address, he shared his career experiences, roles and responsibilities of his posts in each stations, how a student get ready for job. He delivered a special lecture on “Current Scenario of Civil Engineering”. He shared his knowledge on Software Skills, he showed various softwares for Design and Detailing of Design of RC Structures, Drawing tools, how effectively these softwares can be used, and free softwares available in his blog. He discussed about the need of the Construction Industry, and list of technical areas to be concentrated before completing the course and job opportunities in India and Abroad. All the students were very much attentive and shared their feedback. After his lecture, Certificates were distributed to the students who were undergone training for Infosys, students who attended Internship, and Cash Prizes for the winners of the Technical Quiz conducted on Engineers’ Day. Third year student Mr. Balasubramanian thanked the Chief Guest, Management, Principal, Faculty and Students for their help for arranging this Programme. Memorandum of Understanding (MoU) with M/s. Flux Gen Engineering Technologies Pvt.Ltd,. The department of Instrumentation and Control Engineering is proud to have signed a MoU with M/s. Flux Gen Engineering Technologies Pvt.Ltd, on 04th September 2015 by Principal and Mr. Ganesh Shankar, Managing Director. Flux Gen Engineering Technologies is a renewable energy based company, developing engineering technologies and founded by the alumni of Indian Institute of Technology (IIT'S), Indian Institute of Management (IIM's) and Indian Institute of Sciences (IISc). Flux Gen has successfully completed many projects, like: rural electrification of villages using off-grid solar photo -voltaic panels called MICROGRIDS, Solar on train project in collaboration with Indian railways, Automatic irrigation with solar pumping (using soil moisture analysis). Such developed systems by means of renewable sources become economically viable and engineering wise reliable. This MoU basic aims for the Development of System Developer's Laboratory in campus joint Internship and Student Program Projects involving implementation of renewable Energy based Micro- Grids in Rural India. Two major MoUs were signed with core Multinational giants, National Instruments and YOKOGAWA with the department of Instrumentation and Control Engineering . 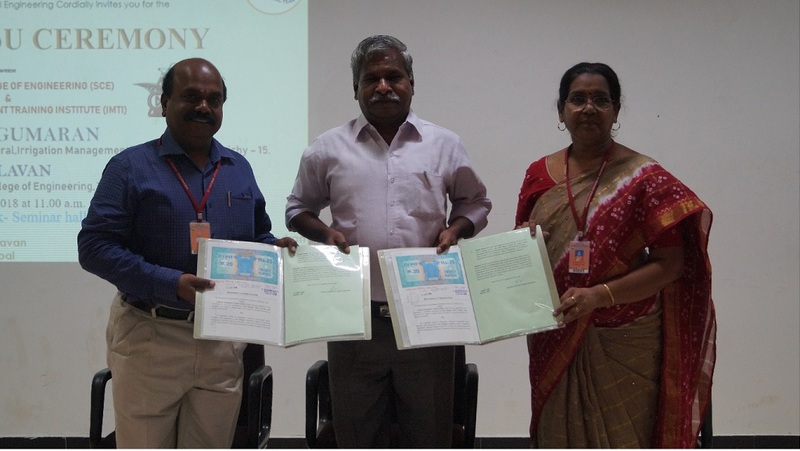 The MoU with National Instruments was signed on 22nd August 2013 by the Principal, and S.Dhanapal Academic Manager of NI. The MoU aims to strengthen the core competency skills of the students and staff, in the area of Virtual Instrumentation, through Labview. It also focuses in producing Certified Labview Academy Developers (CLAD), who would have International validity, and recognition. Another MoU was signed with M/s. YOKOGAWA, on 24th October 2013 by Principal and Mr. S.Senthil, Assistant Manager Customer Service Division, YIL. This MoU basic aims for providing exclusive training with hands on experience in core control engineering applications using real time Distributed Control System, and Programmable Logic Controller. Memorandum of Understanding (MoU) with M/s TREND Instrumentation and Automation Pvt. Ltd. The department of Instrumentation and Control Engineering is proud to have signed a Memorandum of Understanding with TREND Instrumentation and Automation Pvt. Ltd., Chennai on 11th October, 2014. The Principal signed the documents, on behalf of the college, in the presence of the Director, Dean of Academics, Head of the department of Instrumentation and Control Engineering and Head of Training and Placement. TREND Instrumentation and Automation Pvt. Ltd. is an ISO 9001:2008 Certified Company providing complete solution for Instrumentation, Automation and Electrical activities for various process industries. They also train students in various industrial skills that are in demand in the Instrumentation Industry. The department has initiated a positive tie-up with TREND Instrumentation and Automation Pvt. Ltd. with hopes of mutual benefit and growth in the days to come. The department also encourages the students to actively take part in the future activities as a result of this MoU.